Low prices. OrangeSmile.com offers car hire service in Burkina Faso on the lowest-rate-guarantee basis, since we work with car suppliers directly. For your search criteria in Burkina Faso, we always select and show the best rental offers. The car reservation process consists of 3 simple steps: (1) search for available cars for your dates in Burkina Faso; (2) select your car type; and (3) fill in the booking forms. Once the reservation is completed, you will receive a confirmation voucher to your email address. During the booking process, please check your rental conditions. To pick up your car at the rental point in Burkina Faso, you need to provide our confirmation voucher, your driving license and a valid credit card. The final payment is normally carried out at the pick-up point. Our car hire points in Burkina Faso accept VISA, MasterCard, etc - please check your rental conditions. At the pick-up point, please read the handling manual and check the car for present defects. 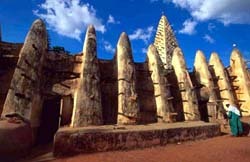 OrangeSmile.com wishes you a pleasant journey to Burkina Faso! The car hire reservation system OrangeSmile.com allows renting a vehicle in Burkina Faso within 10 minutes. Our largest database of car suppliers enables us to provide you a rental car in Burkina Faso at the cheapest rate ever possible. At rental locations in Burkina Faso we offer the following car sizes: mini, compact, economy, standard, premium and luxury. The following car types are available in Burkina Faso: Sedan, Hatchback, Jeep, Cabriolet, Coupe, Minivan and Minibus. Mysterious and exotic, Burkina Faso is an emerging vacation destination. Nature landmarks remain the most popular activity for travelers in this country. A camel ride to the desert is an unforgettable experience. These rides start from Gorom Gorom and differ in length as they can last few hours or travelers can spend a night in the desert. Don’t forget to take warm clothes and blanket as it’s cold in the desert at night, even in Africa. The next stop for curious travelers is the waterfalls near Banfora. The hike along the waterfalls is a great way to enjoy breath-taking views of the surroundings. There is also a lake in this region, which is home for the hippos. Visitors are welcome to rent pirogues and see the animals in their natural habitat in details. If you want to see giant crocodiles, head to Ouaga, which is famous for its crocodile lakes. West of Banfora is famous for the Sindou peaks. The peaks look very unusual – the needle-like look is the effect of wind erosion. The villages near the peaks are a great place to know more about Senoufo culture, buy authentic souvenirs and national clothes. In many towns like Ouagadougou it’s possible to buy fabrics and have African outfits tailored for quite a modest fee. The city of Bobo-Dioulasso attracts travelers who come to see the Mud Mosque. The city also has a zoo, a large pottery market and several notable landmarks of the colonial era that belong to “neo-Sudanic” style. The capital of the country, Ouagadougou, is defined by many interesting places like Ouagadougou Cathedral built back to 1930s. This is one of the biggest cathedrals in Western Africa. Bangr Weogo Park is a large park with many paths for walking, its own small zoo and a small “sacred forest” with old pre-colonial era trees. Other notable landmarks include Grand Mosque of Ouagadougou, the Museum of Music, the National Museum, L’Unite Pedagogique, Naba Koom and Garden of Ouaga-Loudun Friendship. Burkina Faso is considered the “home of music” for whole West Africa, so there’s no wonder that best music festivals are also held in this country. Travellers will find here music festivals to fit every taste, but the most famous ones are Festival des Masques et des Artes (festival of masked dancers), Festival Jazz (jazz festival), Festival International de la Culture Hip Hop (international festival of hip hop music), Semaine National de la Culture (a week-long festival dedicated to national culture), and Festival Panafricain du Cinema (the largest film festival in Africa). In order not to lose the vehicle in case of your arrival delay, please call the rental office in Burkina Faso in advance and indicate your new expected time of arrival. The office contacts can be found in your confirmation voucher.